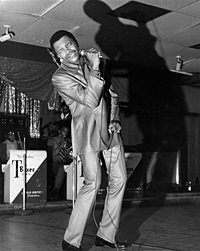 The Windy City's Otis Clay is perhaps today's best representative of the deep soul tradition that began back in the early 1960s by the likes of O.V. Wright, Otis Redding, James Carr, Ollie Nightingale and Solomon Burke. Deep Soul, and Clay's style, owes a debt to both blues and gospel music. By the late 1970s, dsco and funk had pushed deep soul off the charts and Clay was forced to look abroad to sustain his livelihood. Japan provided an unlikely haven for deep soul artists and Clay toured the Orient several times and made two live albums there. He still recorded stateside, recording both deep soul and gospel and would score one on the biggest gospel records of the 1980s, "When the Gates Swing Open." At this years Ponderosa Stomp, Clay will be reunited with the Hi Rhythm Band which is an added bonus.